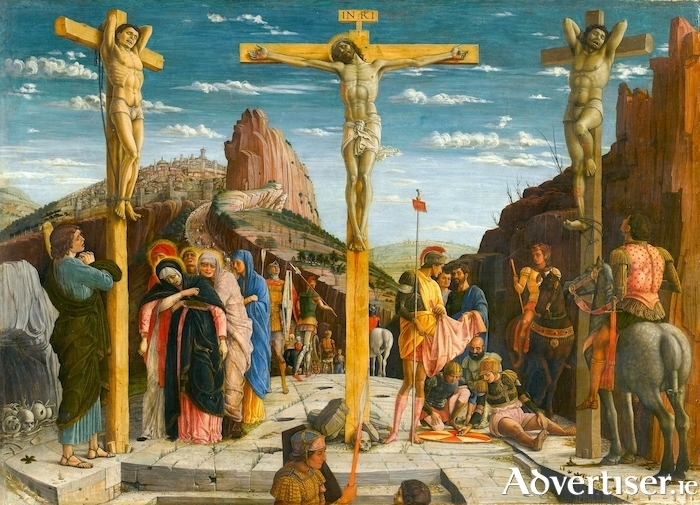 Andrea Mantegna's depiction of The Crucifixion. MARY WEPT at the foot of the cross as her crucified son died; King David was plunged into grief at the death of his son Absalom in battle, while Rachel was left in Ramah to mourn her lost children. The Bible has many stories of parents outliving their children, and grieving over their tragic, early deaths. These stories have given rise to extraordinary pieces of music, which will be performed at the annual Music For Galway Good Friday concert. Entitled Filius Meus - from the Latin for the cry of the bereaved parent - takes place on Friday March 30 at 5pm in St Nicholas’ Collegiate Church, and will hear Thomas Tomkins' 'When David Heard'; Jonathan David's 'Stabat Mater'; Giaches de Wert's 'Vox In Rama'; Herbert Howells' 'Take Him, Earth, For Cherishing'; George Kirbye's 'Vox In Rama'; and Knut Nystedt's 'Stabat Mater'. The concert has been devised and directed by Mark Duley, who will be joined by cellist Adrian Mantu (ConTempo Quartet ), and the Collegium chamber choir, one of five choirs making up St Nicholas Schola Cantorum. Tickets are €15/12/6 via www.musicforgalway.ie, 091 - 705962 or O’Maille’s Original House of Style. Can't get enough of ConTempo?